If you look closely at certain majestic oak trees that cover St. Simons Island, it&apos;s possible to find one gazing back at you. Either peering out from the trunk (in-between two huge branches) or from the stub of a long-vanished branch, you may see the unmistakable image of a weathered face. These are the Tree Spirits of St. Simons Island. Where Did These Carvings Come From? In the 1980&apos;s, artist Keith Jennings decided to make his mark on St. Simons Island, carving about 20 faces from the island&apos;s famous oak trees. Each unique face is hand-carved, taking the artist between two and four days to complete. It&apos;s not surprising that they each have a unique personality and look! Visit the St. Simons Island Welcome Center to learn more, and ask about new ones that are popping up across the island! What Is the Tree Spirit Mythology? Legend has it, the images immortalize the countless sailors who lost their lives at sea aboard the mighty sailing ships that were once made from St. Simons Island oak. Their sad, sorrowful expressions seem to reflect the grieving appearance of the trees themselves with their drooping branches and moss. But if you look a little closer, you can see that there are more than just sailors amongst these tree faces. Artist Keith Jennings attributes the artwork to the spirit of the tree. He carefully carves the faces from the wood, but his artwork simply reveals each tree&apos;s soul. The trees really do all of the work. Search for them yourself throughout St. Simons Island, and come up with your own legends and mythology about these wonderful spirits! Where Can We Find the Tree Spirits? As mentioned, there are about 20 tree spirit carvings scattered around St. Simons Island, Georgia, with more being created each year. However, many of these are on private property. Still one of the more popular things to do on St. Simons Island, searching for the tree spirits that the public can access is an incredible family-friendly activity all year long! 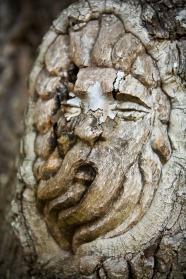 View our St. Simons Island tree spirits map to find the public ones. Take a family bike ride around the island, spend the day on a long scavenger hunt walk around the island, or participate in other activities along your way. No matter how you find them, the tree spirits won&apos;t disappoint! Don&apos;t forget to stop by one of our Golden Isles Welcome Center locations for the most up-to-date information about Tree Spirits and insider knowledge about where the new ones will be popping up!